Recerntly Facebook introduced a new real gift service for its users. Now there is time for the official launch of this service. 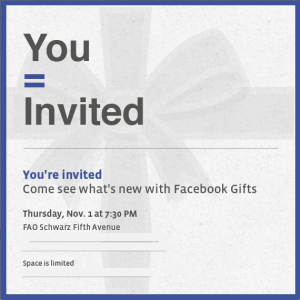 For this purpose Facebookk sent invitation cards to press late on Thursday Night. The officials of the leading social media site have invited press members on a big event which will be going to be held in New York City on Nov. 1. “Come to see what’s new with Facebook Gifts”. The invitation card also includes the wording “You= Invited” in front of grey scale packaged gift. This function will be held at FAO Schwarz on Thursday, Nov. 1 at 7:30 p.m. This marks the latest technology company to hold a press event in the coming weeks. The news about this event comes shortly after when Facebook announced that it is going to allow its members to buy and sell real gifts for their friends. This service will be gradually provided to the users all around the world. The users of this social media giant have marked it as the great achievement of Facebook. The analysts are of the opinion that in this way, the company will attract more users and thus this will increase its user’s base. Al though the company has already launched the virtual gift service for its users but this new service will have more new and advanced features. A hope of successful completion of this event is also there, a press associate member claims.